I will not charge travel for any piano within an hour of Portland, Maine. I am willing to travel farther, although I will sometimes charge for considerable distances and trips to islands if there aren’t enough other customers in the area. If you are dramatically outside my area, see my Resources page for other technicians. I offer discounts to regular customers, schools, churches, retirees, nonprofits, and home-schooling families. I also have special deals for piano teachers. “Can I put my name on it?” When I finish working on your piano, I’ll leave a signed card on it: This represents that I believe I’ve done my best work, and that I’m pleased to put my name to it. 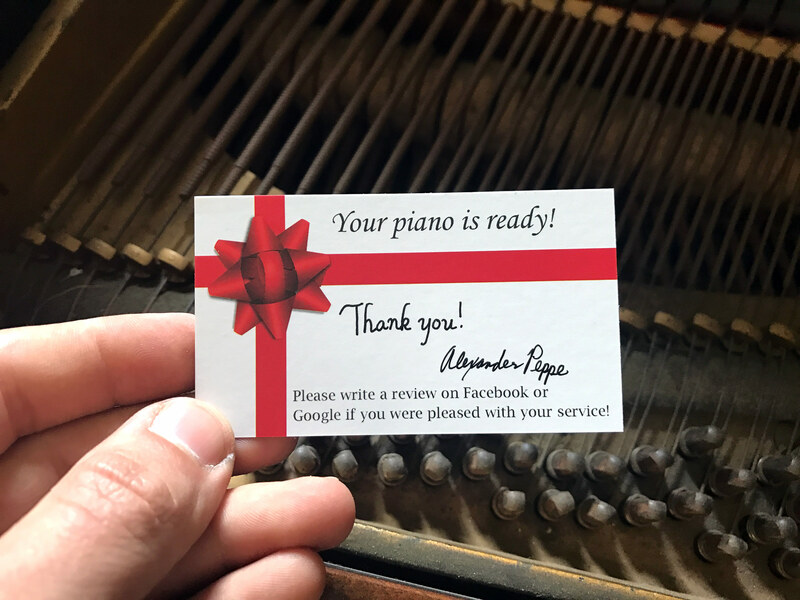 If you have any problems with the piano at all, whether in terms of tuning or mechanical issues that you feel I’ve overlooked, let me know. I guarantee all of my work completely. Please pay at time of service. I prefer to be paid by check. I accept debit/credit card payments through PayPal. Price information is as of December 23rd, 2018, and is subject to change.